Mezza House has been on Main Street in Hackettstown for 2-1/2 years but it only caught my eye last week. Loving Lebanese and Mediterranean food as I do we lost no time in making a reservation for dinner. The restaurant is cozy/small and run by chef owner Nellie, who makes you feel so at home it's like having a Lebanese mother cook your dinner. Everything is made from scratch including the kibbeh (a savory mixture of ground beef and spices stuffed with lamb and pine nuts) so popular there was none available which means we have to return as soon as possible! We loved the hummus, and the M'Jadara, a traditional dish of lentils, rice, and caramelized onions served with a copious amount of creamy, snowy white whipped garlic so delicious I actually asked for more. Nellie shared that it is garlic, olive oil and lemon juice, pureed in a food processor. She would make a fortune if she bottled it. We were too full for dessert but had to try to baklava and so glad we did. 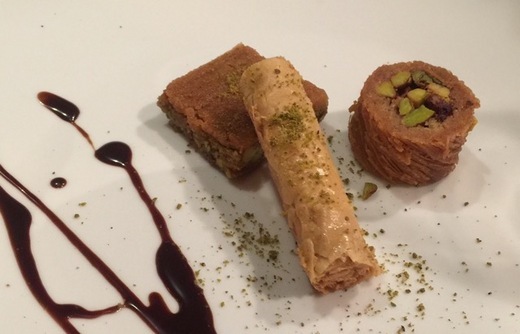 It was the least sweet baklava I've ever experienced--deliciously crispy and flavorful---some with whole pistachios. Mezza House is open for lunch and dinner and reservations can be made on Open Table or at (908) 269-8141. It is a bring your own bottle restaurant and your wine will be enhanced by the most beautiful wine glasses I've seen in any restaurant in the area.